Our partners provide heat exchanger service and parts in the following areas. 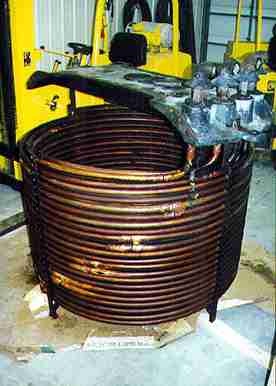 Refurbishment: DraCool-USA is a full service plate heat exchanger company. A team of professionally trained technicians opens the heat exchanger, removes all the plates, and returns the plate pack to a DraCool-USA facility for refurbishment. Plate refurbishment includes cleaning, dye penetration testing, re-gasketing and heat curing of all plate packs. Once the plate packs are refurbished, DraCool-USA returns them to the site and reinstalls them. The team verifies that each plate pack is configured properly and is correctly aligned, and closes the unit according to the manufacturer's specifications. For larger units, DraCool-USA provides hydraulic closing. 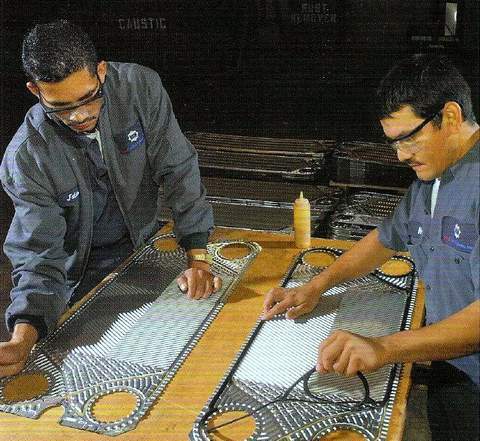 The standard turnaround time for plate pack refurbishment is 10 to 12 workdays. The company also offers on-site and expedited service for emergency repairs or limited downtime. The company's technicians are trained in OSHA-required safety procedures, and DraCool-USA has fulfilled all safety requirements and site-specific training, and has a zero accident rating. The following are DraCool-USA's on-site services. Hydro-Testing: DraCool-USA can hydro-test units, which fills them with water one side at a time and pumps air into them to pressurize them to check for leaks. If both sides of a unit pass the pressure test, the unit is ready for operation. If a leak is present, DraCool-USA opens the unit to resolve the leak's cause. 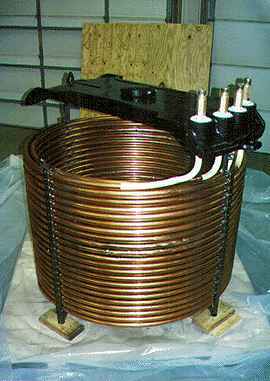 This process is repeated until both sides of the unit pass the hydro-test. On-Site Plate Washing and/or Gasket Replacement: The DraCool-USA team can service a plate heat exchanger on customer site. 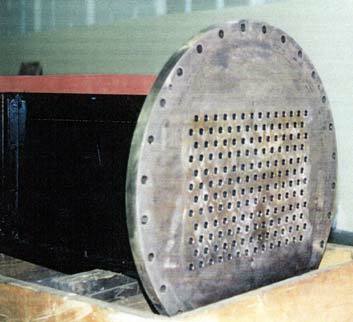 In some applications, the team can reuse the gaskets and remove and wash the plates. This allows customers to minimize downtime by not sending the plates to another location for refurbishment. 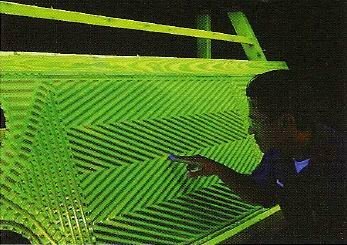 Before the on-site work is performed, the DraCool team analyzes the plate heat exchanger type, the gaskets to be used, and the product passing through the unit to advise the customer of the risks involved based on the repair difficulty. Once plates are cleaned and validated, the team installs new gaskets. For most plate packs, the gaskets are installed on the plates using a variety of adhesives. The plates are then heat cured (baked) at over 300 degrees in in DraCool-USA's large ovens. This process provides a solid bond between the gasket and plate, and a much better seal for the installed plate pack. Emergency Service: DraCool-USA also provides on-site washing service on a 24x7 emergency basis. DraCool-USA's plate pack exchange program allows customers to have minimum downtown after sudden breakdowns that require emergency service. DraCool-USA maintains an inventory of popular plate packs that are clean, gasketed, and ready for immediate installation. DraCool-USA has an extensive line of OEM and equivalent parts for all plate heat exchanger makes and models as well as gaskets in a variety of rubber compounds: standard and high temperature NBR, HNBR, EPDM, IIR, standard FKM (Type A Viton), steam type FKM (Type B Viton), and high performance FKM (Type G Viton). Plates are available in 316 stainless steel and other metals. Plates and gaskets are made to exacting specifications. New and Replacement Bundles: CMS manufactures a variety of new and replacement bundles in all sizes and construction materials, from 4" x 24" to 54" x 30' long. 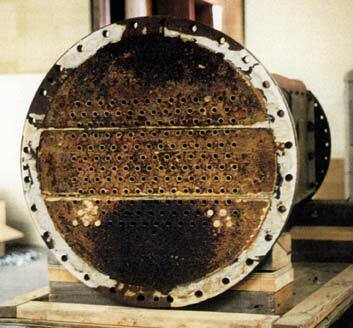 Repair and Refinishing: Fouling and corrosion decrease a heat exchangers efficiency and lead to expensive downtime. CMS offers repair and refurbishing of most standard units. 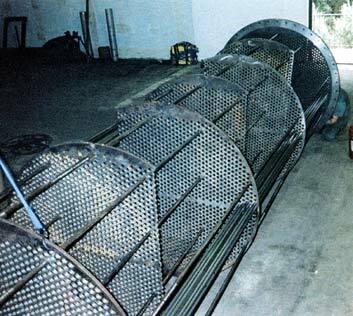 Heat Exchangers (All Designs): HEXECO, Inc.
For more information on HEXECO's repair services, click here to visit the repair service site.